You might be thinking everythingâ€™s okay: the stock market is on the rise, jobs are growing, the worst of it is over. 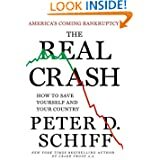 In The Real Crash, New York Times bestselling author Peter D. Schiff argues that America is enjoying a government-inflated bubble, one that reality will explode . . . with disastrous consequences for the economy and for each of us. Schiff demonstrates how the infusion of billions of dollars of stimulus money has only dug a deeper hole: the United States government simply spends too much and does not collect enough money to pay its debts, and in the end, Americans from all walks of life will face a crushing consequence. Weâ€™re in hock to China, we canâ€™t afford the homes we own, and the entire premise of our currency—backed by the full faith and credit of the United States—is false. Our system is broken, Schiff says, and there are only two paths forward.Â The one weâ€™re on now leads to a currency and sovereign debt crisis that will utterly destroy our economy and impoverish the vast majority of our citizens. However, if we change course, the road ahead will be a bit rockier at first, but the final destination will be far more appealing.Â If we want to avoid complete collapse, we must drastically reduce government spending—eliminate entire agencies, end costly foreign military escapades and focus only on national defense—and stop student loan or mortgage interest deductions, as well as drug wars and bank-and-business bailouts. We must also do what no politician or pundit has proposed: America should declare bankruptcy, restructure its debts, and reform our system from the ground up. Persuasively argued and provocative, The Real Crash explains how we got into this mess, how we might get out of it, and what happens if we donâ€™t. And, with wisdom born from having predicted the Crash of 2008, Peter Schiff explains how to protect yourself, your family, your money, and your country against what he predicts. 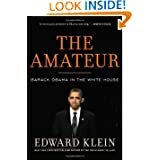 Klein, who is known for getting the inside scoop on everyone from the Kennedys to the Clintons, reveals never-before-published details about the Obama administration’s political inner workings, as well as Barack and Michelle’s personal lives.